Shalom World’s Media Gallery! 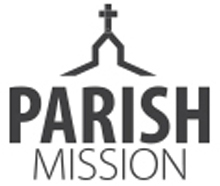 Stream exciting Catholic content live on your diocesan and parish website. Set up is easy and secure. Uplifting personal testimonies, vocation stories, talk series, Biblical teachings, conferences from across the country and much more. Shalom’s Media Gallery increases traffic to your diocesan or parish website. Guests to the Gallery stay within your website. Closing the Media Gallery window or tab launches viewers back to Homepage. All hosting is done by Shalom World. No extra storage, nor hidden costs or fees are required. 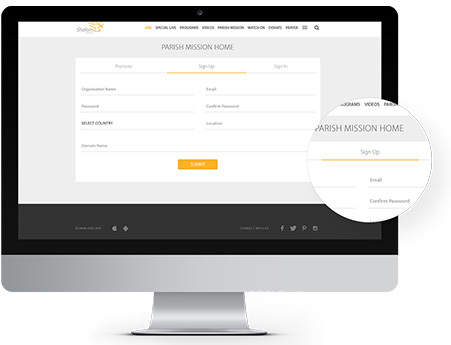 Content is secure, with no private information collected from the visitors or by the website. Visit www.shalomworldtv.org/mediagallery and register for free. Access instructions and necessary code to add the Media Gallery to your website. Choose to have the Media Gallery listed as a tab option or as a floating text icon on the bottom right corner of your website. 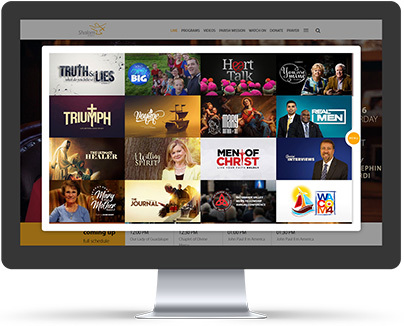 Once embedded on your homepage, The Media Gallery streams 24/7 – just a simple click opens Shalom World TV and live content within a window on your homepage. 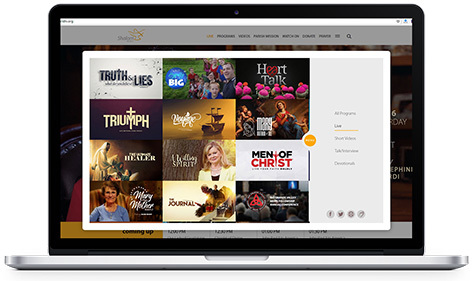 Parishes and dioceses everywhere are launching interactive websites, tapping into the power of the internet in enriching and spreading peoples’ faith. Now, Shalom World’s Media Gallery adds a special dimension to these sites, prompting faithful to dip in for enrichment and uplift any time of the day or night. Our Church is Universal, and the internet reflects that! Let’s harness the internet for God, opening to all a wider access to Catholic Faith and Tradition, and a deeper walk with Christ. Congratulations! Your registration for Media Gallery is successful. Please Sign In to get the embed code to integrate Media Gallery into your website. This field is required and should be in email format. This field required minimum of 8 characters. Select Country AFGHANISTAN ALBANIA ALGERIA AMERICAN SAMOA ANDORRA ANGOLA ANGUILLA ANTARCTICA ANTIGUA AND BARBUDA ARGENTINA ARMENIA ARUBA AUSTRALIA AUSTRIA AZERBAIJAN BAHAMAS THE BAHRAIN BANGLADESH BARBADOS BELARUS BELGIUM BELIZE BENIN BERMUDA BHUTAN BOLIVIA BOSNIA AND HERZEGOVINA BOTSWANA BOUVET ISLAND BRAZIL BRITISH INDIAN OCEAN TERRITORY BRUNEI BULGARIA BURKINA FASO BURUNDI CAMBODIA CAMEROON CANADA CAPE VERDE CAYMAN ISLANDS CENTRAL AFRICAN REPUBLIC CHAD CHILE CHINA CHRISTMAS ISLAND COCOS (KEELING) ISLANDS COLOMBIA COMOROS CONGO CONGO THE DEMOCRATIC REPUBLIC OF THE COOK ISLANDS COSTA RICA COTE D'IVOIRE (IVORY COAST) CROATIA (HRVATSKA) CUBA CYPRUS CZECH REPUBLIC DENMARK DJIBOUTI DOMINICA DOMINICAN REPUBLIC EAST TIMOR ECUADOR EGYPT EL SALVADOR EQUATORIAL GUINEA ERITREA ESTONIA ETHIOPIA EXTERNAL TERRITORIES OF AUSTRALIA FALKLAND ISLANDS FAROE ISLANDS FIJI ISLANDS FINLAND FRANCE FRENCH GUIANA FRENCH POLYNESIA FRENCH SOUTHERN TERRITORIES GABON GAMBIA THE GEORGIA GERMANY GHANA GIBRALTAR GREECE GREENLAND GRENADA GUADELOUPE GUAM GUATEMALA GUERNSEY AND ALDERNEY GUINEA GUINEA-BISSAU GUYANA HAITI HEARD AND MCDONALD ISLANDS HONDURAS HONG KONG S.A.R. HUNGARY ICELAND INDIA INDONESIA IRAN IRAQ IRELAND ISRAEL ITALY JAMAICA JAPAN JERSEY JORDAN KAZAKHSTAN KENYA KIRIBATI KOREA NORTH KOREA SOUTH KUWAIT KYRGYZSTAN LAOS LATVIA LEBANON LESOTHO LIBERIA LIBYA LIECHTENSTEIN LITHUANIA LUXEMBOURG MACAU S.A.R. MACEDONIA MADAGASCAR MALAWI MALAYSIA MALDIVES MALI MALTA MAN (ISLE OF) MARSHALL ISLANDS MARTINIQUE MAURITANIA MAURITIUS MAYOTTE MEXICO MICRONESIA MOLDOVA MONACO MONGOLIA MONTSERRAT MOROCCO MOZAMBIQUE MYANMAR NAMIBIA NAURU NEPAL NETHERLANDS ANTILLES NETHERLANDS THE NEW CALEDONIA NEW ZEALAND NICARAGUA NIGER NIGERIA NIUE NORFOLK ISLAND NORTHERN MARIANA ISLANDS NORWAY OMAN PAKISTAN PALAU PALESTINIAN TERRITORY OCCUPIED PANAMA PAPUA NEW GUINEA PARAGUAY PERU PHILIPPINES PITCAIRN ISLAND POLAND PORTUGAL PUERTO RICO QATAR REUNION ROMANIA RUSSIA RWANDA SAINT HELENA SAINT KITTS AND NEVIS SAINT LUCIA SAINT PIERRE AND MIQUELON SAINT VINCENT AND THE GRENADINES SAMOA SAN MARINO SAO TOME AND PRINCIPE SAUDI ARABIA SENEGAL SERBIA SEYCHELLES SIERRA LEONE SINGAPORE SLOVAKIA SLOVENIA SMALLER TERRITORIES OF THE UK SOLOMON ISLANDS SOMALIA SOUTH AFRICA SOUTH GEORGIA SOUTH SUDAN SPAIN SRI LANKA SUDAN SURINAME SVALBARD AND JAN MAYEN ISLANDS SWAZILAND SWEDEN SWITZERLAND SYRIA TAIWAN TAJIKISTAN TANZANIA THAILAND TOGO TOKELAU TONGA TRINIDAD AND TOBAGO TUNISIA TURKEY TURKMENISTAN TURKS AND CAICOS ISLANDS TUVALU UGANDA UKRAINE UNITED ARAB EMIRATES UNITED KINGDOM UNITED STATES UNITED STATES MINOR OUTLYING ISLANDS URUGUAY UZBEKISTAN VANUATU VATICAN CITY STATE (HOLY SEE) VENEZUELA VIETNAM VIRGIN ISLANDS (BRITISH) VIRGIN ISLANDS (US) WALLIS AND FUTUNA ISLANDS WESTERN SAHARA YEMEN YUGOSLAVIA ZAMBIA ZIMBABWE This field is required. Enter the email address associated with your account and we’ll email you a link to reset your password. Email not found in our list.